Place eggs in single layer in medium saucepan. Add enough water to cover eggs by 1 inch. Bring to a boil. Immediately remove from heat; cover and let stand 15 minutes. Drain; rinse with cold water. Place eggs in bowl of ice water; let stand 10 minutes. Drain. Peel eggs; cut lengthwise in half. Remove yolks; place in medium bowl. Add mayonnaise and mustard; blend well, mashing yolks just until smooth. Mix in relish, pepper and ham. Spoon mixture into egg white halves. Sprinkle with paprika. Serve immediately or cover and refrigerate until serving time. 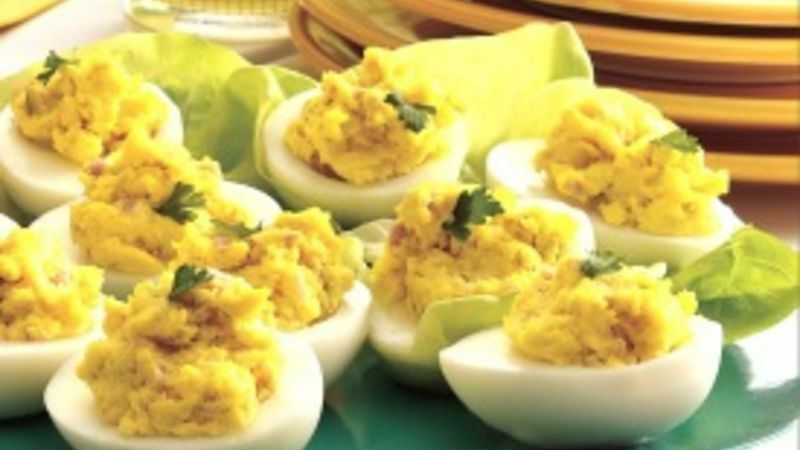 Hard-cooked egg halves will slide around on the serving platter so try lining the platter or a plastic container with shredded lettuce, then tuck the eggs in the lettuce for easy toting or serving.